At present, the Division of the Humanities and Social Sciences (chaired by Prof. Domas Kaunas) has 19 full members, eight members emeriti, and eight foreign members. The Division conducts its activities in three sections: the humanities (chaired by Prof. Grasilda Blažienė), social sciences (Prof. Vytautas Nekrošius), and the arts (Rūta Janonienė). The humanistic thought is an inseparable link between research and culture of Lithuania and therefore it is not incidental that humanities were the dominant discipline in the newly-established (16 January 1941) Lithuanian Academy of Sciences. Initially, the Division of the Humanities comprised the Institute of the Lithuanian Language, the Institute of Lithuanian Literature, the Institute of Ethnology, and the Institute of History. The Division of Social Sciences comprised the Institute of Economics and the Institute of Lithuanian Law and Economy. Activities of the members of the academy were not interrupted even during the years of the German occupation: they were engaged in compiling the volumes of the academic dictionary of the Lithuanian language, managing collections of folklore, archival documents, materials of earlier archaeological explorations, and statistical data on the country‘s social and political development. During the post-war years, humanities and social sciences were coercively ideologised, but the ideas of the nation’s statehood and sovereignty, intellectual maturity of the Lithuanian people, and their moral and economic well-being. Even in Soviet times the Lithuanian Academy of Sciences resisted Russification and Sovietisation of research, and upheld Lithuanian as the main language of communication. The Academy provided shelter to the country’s outstanding figures who were victims of political persecution. With the support of creative intelligentsia, the Lithuanian Academy of Sciences was the hotbed of the Sąjūdis initiatives, the Greens (Žalieji), and other democratic movements. It was here that the draft of the Constitution of the Republic of Lithuania was prepared. Members of the division are active in fostering research into the Lithuanian language and literature, folklore, the history of Lithuania, cultural and ethno-cultural heritage, philosophy, the country’s finance, economics, social changes, and international and civil law. Founded by the members of the academy, schools in various disciplines have gained international recognition. The school of linguistics shaped by Zigmas Zinkevičius, Vytautas Mažiulis, Aleksas Girdenis, Algirdas Sabaliauskas, and other scholars laid the foundations for Vilnius becoming a global centre of Baltic studies. Other schools of national significance evolved: the works by Vytautas Merkys and Antanas Tyla revealed the depth of the achievements in the discipline of the history of Lithuania, while those by Eduardas Vilkas and Aleksandras Vasiliauskas made an immense contribution to the studies of economics. The poetic culture of Lithuania and the country’s national revival can hardly be perceived without Justinas Marcinkevičius’s creative work. The humanities and cultural maturity of the present time are strongly influenced by the latest works of the academy members. Marijus Algirdas Šliogeris’s works, his way of thinking, and the dimension of his thought are significant to the philosophy of recent decades. Books on literary phenomenology by Viktorija Daujotytė-Pakerienė contain original insights into the association of literature with other layers of spiritual life. Giedrius Kuprevičius’s music and its actualisation reflect modern shifts in musical culture. Mention should be made of the work by the architect Rolandas Palekas, art historians Algirdas Gaižutis and Rūta Janonienė, philosopher and cultural scholar Antanas Andrijauskas, and philosopher Evaldas Nekrašas. 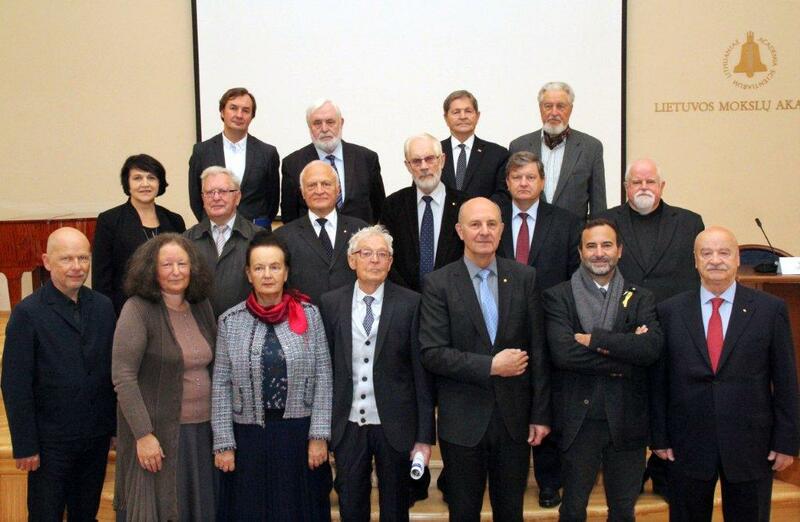 The fields of the humanities and social sciences in Lithuania are expanded by the works of the historians and archaeologists Edvardas Gudavičius, Eugenijus Jovaiša, Zigmuntas Kiaupa, Rimvydas Petrauskas, and Vladas Žulkus, literary scholars Vytautas Martinkus, Jūratė Sprindytė, and Leonardas Sauka, linguists Grasilda Blažienė and Bronislavas Stundžia, sociologists Zenonas Norkus, Arvydas Virgilijus Matulionis, and Romualdas Grigas, lawyers Pranas Kūris, Vytautas Nekrošiaus, and Valentinas Mikelėnas, and economists Antanas Buračas and Romas Lazutka. The names of other members of the Academy and research positions associated with them are gaining visibility in the local and international research arena. Every year, the division organises a number of academic conferences and round table discussions on relevant issues of research, art, culture, and preservation of cultural heritage. Commissioned by local and foreign institutions, its members carry out various expert appraisals, take part at various programmes in the country and abroad, in the activities of public organisations and NGOs, and in the work of editorial boards of local and foreign scientific publications. Members of the Division of the Humanities and Social Sciences make a notable contribution to educational and civic initiatives and carry out important and significant work in nurturing people’s civic spirit and educating young people in tertiary education. Every year, the division produces 15-20 monographs, books, and other publications, publish 70-80 articles, publicise over 50 science popularisation articles, give 60-70 lectures to the general public. They are especially active in the radio and television (over 100 annual appearances), produce original shows, give interviews, and share their comments on the internet.